While winter might be nipping at our heels, there is no denying that spring is around the corner. 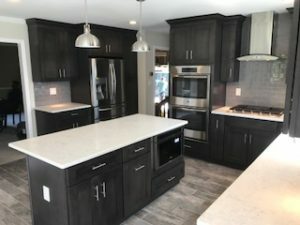 And, in the spirit of spring, it is time to tackle those remodeling projects we have put off, particularly that much needed kitchen remodel. I personally look forward to putting winter behind me, rejoicing in the warm weather, and entertaining the friends and family I have neglected all winter. Whether your style lends itself to the traditional, simplistic, contemporary, sophisticated or eclectic, and whether your space is small or large, Interior Excellence can help create the kitchen of your dreams! While granite counter tops are always popular, quartz is often desired (sturdy, easy to maintain.) Don’t rule out marble with bold veins running through as a dramatic choice for some. Popular color choices for 2018 include neutral tones (grays, whites, creams) with accent colors (dark colors, jewel tones, or whatever makes you smile). But don’t rule out ocean inspired colors, and black as an accent color (or for appliances) can also be used to add drama. And of course, one cannot forget smart kitchen appliances (apps on your phone to preheat your oven, apps to look into your refrigerator to see what groceries you need). The options are endless, and at Interior Excellence we work with you (explore your visions) to create the kitchens of your dreams. Interior Excellence is an interior renovations company that can turn your desires into a reality. We are a One Stop Design Shop, which specializes in kitchen, basement and bathroom remodeling. We can meet all of your design and renovation needs. You deal only with us, and we handle permits, architectural plans, plumbing, electrical, flooring and all your design needs. We take you shopping, provide you with 30 plus years of design expertise and pass our designer discounts on to you. We come highly recommended and encourage you to reach out to our references.